Both cameras can be accessed at the same time. But by clicking on the center of a screen, you may access a 'full screen' camera view one at a time. Liberty and Justice will be laying the eggs in a few weeks and, because of the generosity of Alcoa, we will be able to monitor the goings-on within the nest on a 24hr/7day/365dpy basis. This is truly a wonderful learning experience for children of all ages! Enjoy this fascinating and devoted family! I must share our Bald Eagle thread with another astonishing and sweet family I have been watching for weeks: The Laysan Albatross. Located in Kauai Hawaii, Cornell Labs has an Albatross Cam on the parents and a newly hatched chick. The baby, hatched on January 27th is named Kaloakulua; Mom is Kaluahine; Dad is Kaluakane. The parents each take turns caring for the chick. Other Albatross are also nesting in the area and some non-breeding neighbors will stop by at times to visit the family. Local roosters, hens and other birds also frequent the nesting sites and birds of many kinds can be heard singing in the background of this lovely place. I hope you enjoy these extraordinary and beautiful seabirds. As the chick, Kaloakulua, continues to grow and thrive, his parents leave the nest - sometimes singly and sometimes both are gone simultaneously - for days at a time in order to return to the sea. It will take both parents to provide enough nourishment to support the chick's growth. It is amazing how instinct guides such a youngster; the chick is preening itself, conducts 'nestoration' activities, and has left the nest bowl on occasion as it wanders near by. Other Albatross families nest nearby. I hope you enjoy this wonderful and precious family. We have egg #1, which was laid late last evening! Here is the beginning of another exciting story starring our Bald Eagle friends, Liberty and Justice, on the proper techniques employed in raising and caring for baby eaglets from (birth) through college. Spring has finally arrived, even if Iowa has more snowfall. Please enjoy them! A brief update on the Laysan Albatross chick (hatched on 1/27/14). When the parents are off foraging, Kaloakulua is regularly visited by adult non-breeding albatross that also reside in the colony. What amazingly social birds the albatross are in so many ways! Please enjoy this amazing family! Our little Laysan Albatross on Kauai, HI. took her first real steps on April 11th.! Additionally, DNA results show the 'tross to be a female. Congratulations on your first steps, KK! An update on our Eagle family: Rudy was hatched on April 2nd., the one of two eggs that survived. She has grown nearly to the size of her parents, Liberty and Justice. It's remarkable how quickly the nestlings grow! Hatched on Jan. 27th, this is little KK today; she is about the size of an adult Canada Goose. She will fledge to the Pacific Ocean late June/ July and will be at sea for approximately 3 years before returning. The Laysan Albatross is one of the most gentle and social marvels on our planet. Instinct: So powerful a force that it commands the yearning for the sea to come to the surface even at this young age; with baby down still present, the young albatross is mesmerized by the ocean spread before her, for it is her future...her home. Meet the Osprey, Rachael and Steve, of Hog Island, ME. They have three of the cutest chicks tucked away in the nest. I couldn't resist posting them for you. Our albatross, KK, will be flying to the ocean soon; our eagle, Rudy, is 'branching' out and almost ready to fledge. College awaits! KK, the albatross chick we have been following, has been fitted with her ID bands and a Geolocater, which will record her travels until she returns to the island of Kauai in 3 to 4 years from now. She will be leaving the island any day now to go to her home, the Pacific Ocean. Except for a small amount of fuzz on her head, she has grown into a beautiful young bird, complete with her 7 foot wingspan to carry her over the vast Pacific. At 8:15am (Hawaii Time) our baby Laysan Albatross fledged to the Pacific Ocean, her home. She will return to her island in 3 to 4 years. Live well; live long, KK. Banding of two Osprey chicks, while Mom keeps watch over the procedure as she circles above. In the end, Mom and chicks are fine as they await Dad's delivery of a fish. One of the Osprey at Hog Island in Maine has just fledged this morning. The Osprey, after leaving the nest, migrate independently to South America, and will return in two years. All the best to you, our friend. Hog Island, Maine Osprey: At 7:30 this morning, as Mom (Rachael) proudly watches from the nest, the youngest and last of the three chicks (Pia) fledges the nest (she first flies to the left followed by a fly over to the right in the distance). Although the chicks will be driven by their inherent instincts, the parents will continue to teach and support the young for a few more weeks before all will start their migrations to South America. While the parents will return next year, the chicks will remain in S.A. for their first year. In the meantime, they will continue to use the nest to eat and rest, and just to merely hang around. I hope you enjoyed watching this beautiful Osprey family! It's time to eat...and to eat...and to eat...and to eat....is that 'crop' full yet, lil' one? Meet AEFs Northeast Florida Nest of Bald Eagles, home of Romeo & Juliet. Three stunning camera views monitor their nest 24 hrs. a day, allowing us the opportunity to watch them incubate, hatch, and raise their young. Two eggs have been laid so far. Hatching is expected just before Xmas. Please enjoy this wonderful family of Eagles. Update on Romeo and Juliet, the nesting Eagles in Fl. - American Eagle Foundation Cam (AEF): Eaglet "pip watch" is now underway - awaiting the first of the two chicks to peck at the shell from within and begin the hatching process. Egg #2 will follow shortly thereafter. The cams are on 24/7 :Enjoy observing how Eagles raise their young from hatching through fledging (off to college!). 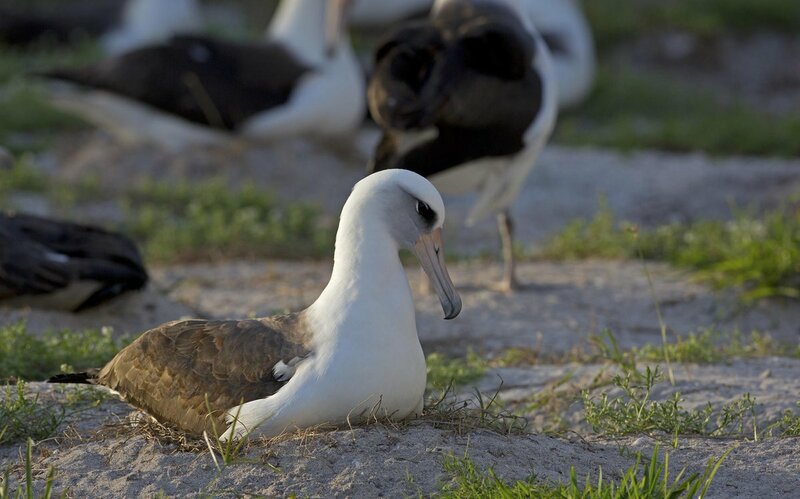 Wisdom, a Laysan albatross who is the oldest known tagged bird in the world, keeps astonishing biologists and her fans with her continued return to the Midway Atoll National Wildlife Refuge in the Pacific. Now she’s brought hope yet again with an announcement this week that she’s expecting another chick at the age of 63. “We are thrilled with the public’s interest in Wisdom. She really captures peoples’ imagination around the world, particularly kids’, and has become a great ambassador for conservation and Midway Atoll National Wildlife Refuge,” said Bret Wolfe, deputy refuge manager. Wisdom was banded in 1956 when she was believed to be 5-years-old and has managed to survive decades – outliving many of her counterparts whose lifespans are estimated to be between 12 and 40 years. At the end of November, she thrilled her followers with her return to her nesting site at Midway where her mate was waiting for her. Albatross mate for life after engaging in an elaborate courtship ritual and only lay one egg every year, making it even more precious for the pair who will spend about a year raising their young together. Wisdom is thought to have successfully raised between 30 to 35 chicks since she was banded. Earlier this month, biologists at the refuge spotted her tending to her newly hatched egg, which they expect will hatch sometime around February 6. As the world’s oldest known bird in the wild, Wisdom is an iconic symbol of inspiration and hope for all seabird species. She provides to the world valuable information about the longevity of these beautiful creatures. In the case of Wisdom, she has logged literally millions of miles over the Pacific Ocean in her lifetime to find enough fish eggs and squid to feed herself and multiple chicks, allowing us the opportunity to measure the health of our ocean which sustain albatross as well as ourselves. According to the U.S. Fish and Wildlife Service, which oversees the refuge, while the population of Laysan albatross has grown to an estimated 2.5 million, 19 out of the 22 species of albatross are threatened or endangered. The Midway Atoll Wildlife Refuge, which is about 1,200 miles northwest of Hawaii, is home to an estimated 70 percent of the world’s population of Laysan albatross. These seabirds continue to face threats from fishing gear, predators and a staggering amount of plastic entering their environment. In October, NOAA sent a team to the Papah?naumoku?kea Marine National Monument, which includes the Midway Atoll National Wildlife Refuge, that cleaned up 57 tons of it. Sadly, many albatross parents unwittingly feed this deadly plastic debris to their chicks, making Wisdom’s success all the more miraculous. To follow updates on Wisdom, her partner and her new arrival, check out her Tumblr page and gallery on Flickr.